Kelite 3 piece Forged Trunnion Mounted Ball Valve is ideally suited for pipeline and other applications within the global energy infrastructure where zero leakage positive shutoff is critical. API Monogrammed and compliant with all relevant industry specifications, Kelite trunnion ball valves should be an integral component of your piping network. Some valves do have operating temperatures that can be very dangerous to people or animals. To avoid any kind of injuries operators must ensure the valve surfaces that reach such temperatures are suitably protected against accidental contact. Operators are recommended to always provide an efficient protection/insulation of the valve surfaces that may be touched by personnel and/or animals and that exceed, in lower or in higher, the human tolerable limits (as a suggestion use -4F through +140F). Prior to exposure to freezing temperatures, it is highly recommended the valve be drained. Water that may be trapped in the body cavity could freeze and impair the operation of the valve or damage the valve. If the valve has a grease fitting in the lower drain, a sufficient amount of antifreeze injected into the body cavity via the lower drain grease fitting will prevent accumulated water from freezing. It is also advisable to inject a sufficient amount of valve lubricant into the grease fittings of valve and operator (if present) prior to extended cold temperature exposure. Trapped water should be drained from stem extensions. Some stem extensions in the field are equipped with plastic plugs that can be removed to drain trapped water from the piped extension. 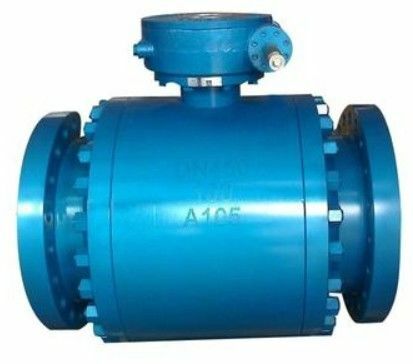 Always perform an API 6D pressure test before re-installing the valve into the line to verify that the maintenance operation have been satisfactorily performed and to re-certify pressure containment capability of the valve. There shall not be any leakage under the pressure when ball is partially open and both ends are blanked. Testing pressure is 1.5 times the maximum operating pressure. Test duration are 2min for 4” and under valves, 5min for 6” to 10” valves, 15min for 12” to 18” and 30min for 20” and larger. Fit the vent valve and set it in open position. Operate the valve to the half-open position. Close the vent valve and apply pressure in accordance with maximum operating pressure of the pipeline. Visually check the outside of the ball valve for leakage. Valves are to be subjected to a hydrostatic seat test. There is to be no leakage under test pressure. Test pressure is to be applied to the appropriate end of the valve. Testing pressures 1.1 times maximum operating pressure. Test durations are 2min for 4” and under valves, 5min for 6” to 18” and 10mim for 20” and larger valves. Operate the valve to the fully close position and open the vent valve. Pressurize one side in accordance with max operating pressure of the pipeline. From the body vent or bleed fitting, check for possible seat leakage. Repeat same operations as per points (b) & (c) on opposite side of the valve. With the valve unseated and partially open, the valve cavity shall be completely filled with test fluid. The valve shall then be closed and the vent valve opened to allow excess test fluid to overflow form the valve – cavity test connection. The test pressure shall be applied simultaneously from both ends. Seat tightness shall be monitored from the cavity connection. The seat test specified in 7.2 shall be repeated at the test pressure between 80 psig and 100 psig using air as the test medium.